Want to fit into your swimsuit, eat some sushi. It’s low in calories, cholesterol and saturated fat, and rich in minerals, omega 3 fatty acids, and vitamins – making it a healthy eat for lunch or dinner. Koji Matsuzaki, Head Sushi Chef at the famous Hokusai restaurant in Beverly Hills, California shares his favorite recipe for you to make at home. 1. In a small saucepan, stir the vinegar, sugar and slat over low heat until the sugar and salt dissolve. Note: Do not let the mixture boil. 2. Set aside to cool and store in a screw top jar. 1. Roll out a full sheet of seaweed (nori). You will notice the press lines running across the surface, fold that line and fold in half. You will end up with a half sheet of seaweed that measures 4×7 inches. Run a knife (or cut with kitchen scissors) and stack these sheets on a plate. Note: Before you start rolling, have a finger bowl with a splash of vinegar and a clean, damp kitchen towel close. 2. 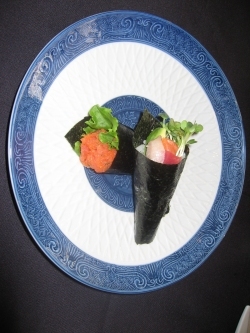 Place the nori horizontally (shiny-side down) on a work surface. Wet your fingers and the palm of your right hand in the finger bowl and scoop out about 2 tablespoons of sushi rice. Form it into a loose oblong roll and press the rice into the left side of the nori. 3. Use a sauce or green horseradish (wasabi) and dab a thin line down the middle of the rice. Place 1 or 2 stripes of 2-3 ingredients (healthy suggestions include: arugula, jicama, mango, grilled chicken, cucumber, fresh crab and/or avocado) in a horizontal line on the opposite side of the rice – let the tops of the ingredients extend out of the top of the roll. Again, less is better, you don’t need as much rice of sushi fillings as you think. 4. While holding the ingredients with your fingers, roll them up like a poster in cone shape. Seal the edges by moistening with a wet finger.